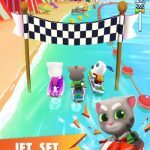 Talking Tom Jetski is a new game from the maker of the Talking Tom franchise, Outfit7, that you can now download for your Android or iOS device. 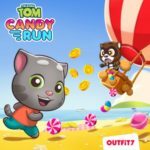 In the game you can ride a jetski as one of two anthropomorphic characters, namely Talking Tom or Talking Angela, and regardless of whom you choose, you’ll get a chance to accomplish tons of missions and pull off several challenges while riding on that jetski. Since this is a casual game, the main objective is to score as many points as possible, though it’s also a good thing to try to accomplish as many missions as possible. So far, Talking Ginger isn’t part of this game, though he should be included in the mix pretty soon. It doesn’t matter whether you’re familiar with Outfit7’s talking characters or not – this is a completely different kind of game from what the company usually puts out. 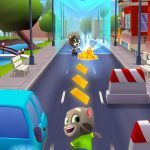 That’s why we’ve compiled these Talking Tom Jetski cheats, tips and tricks, as we’re here to help you make the most out of that exhilarating ride. You’ll mostly be collecting coins in the game, but apart from coins for buying stuff, you can collect other goodies in this game, such as pieces of fruit. In fact, you can go ahead and collect anything you find interesting, though you’ll be better off avoiding items that you believe aren’t worth collecting at all. 2. Which Talking Cat To Pick? One may think that Tom and Angela have their own distinct attributes, strengths, and weaknesses. But the only things different are that Tom’s a male cat and Angela’s a female, and that both look different. Otherwise, they play the same way, so you’re free to pick either of these characters in Talking Tom Jetski without having to worry about one of them having a disadvantage over the other. You’ll have to complete three missions in a set, all in order, to add one point to your score multiplier. Doing that will also unlock a new set of missions, and you’ll also want to try to complete them, once again in order. As Outfit7 has included a whole lot of missions (they don’t say how many in the game’s description), you can theoretically have one heck of a multiplier once you’ve gone far enough. Once you’ve compiled a solid score in the game yet wiped out and ended your game, you’ll be asked if you want to watch a video to continue. This would allow you to resume where you left off, and you can keep doing this as often as you want in a round, as long as the game has some videos for you to check out. 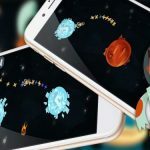 There’s nothing fancy about the power-ups in Talking Tom Jetski. The speed-up allows you to go faster, and the slowdown slows you down – pretty self-explanatory. But there are others, such as the shield (allows you to crash through obstacles), that could also help you immensely in this game.